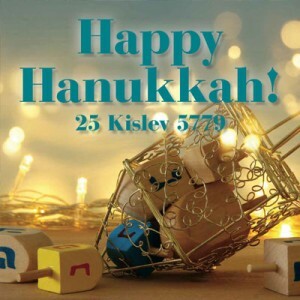 For the past couple of months, I’ve been hearing, “Hanukkah is so early this year!” Yet, according to the Hebrew calendar, Hanukkah is showing up perfectly on time—on the 25th of Kislev. For those of us who live by the Gregorian calendar, however, the Festival of Lights begins at nightfall on Sunday, Dec. 2 with the lighting of the first candle, and the eating of the first latke. In Tidewater, as across America, Hanukkah has evolved over the decades. For me, growing up, it was a quick lighting of the menorah each night. (My mom still uses the same one.) We got a little gelt and ate latkes one night. Most of my classmates weren’t even aware of the holiday. Today, it’s a completely different story. In our home, we add a hanukkiah each night, until on the eighth night, we’re lighting 72 candles! The room even gets hot! We choose between Hanukkah cds or put on Pandora’s Hanukkah station. We eat latkes, exchange gifts, and talk about the story of Hanukkah and the Macabees. How times have changed. Gary Tabakin, a past president of Temple Emanuel, recalls how the holiday was celebrated here in the 1960s and when he noticed the first change. In fact, there’s so much going on in 2018 for Hanukkah in Tidewater that Carly Glikman of Shalom Tidewater compiled a list of lunches, dinners, parties, concerts, and fun events, including Norfolk Admiral’s Hanukkah on Ice—a sure sign that the holiday is now known and celebrated throughout community. In addition to other fun articles, this section offers great gift suggestions from our advertisers. We hope you find something you like—including a new twist on a latke recipe. All of us at Jewish News wish you a very Happy Hanukkah! Growing up in the 1960s in Norfolk, there were no large “public” displays of Hanukah, recalls Gary Tabakin. “In religious school at Beth El, there would be a Hanukah party each year where dreidels and gelt were passed out and students would eat lots of latkes,” he says. Often, says Tabakin, Jewish mothers across Tidewater would go into their child’s public school class to tell the story of the Macabees, light a menorah, and give dreidels to the students. “Each evening,” says Tabakin, “we would wait with great anticipation for my father to come home from work to light the menorah and give my brother and me another gift.” Overall, though, the holiday wasn’t given much time. Not many songs even existed in addition to Rock of Ages and Dreidel, Dreidel, which every Jewish kid knew. One of the two were usually incorporated into schools’ Christmas concerts. Things began to change with the entire community aware of the Festival of Lights. “Today, every night of Hanukkah is celebrated—not just in our homes and synagogues, but in the community,” says Tabakin. JERUSALEM (JTA)—I was watching late night network television on Saturday night—that’s not terribly exciting here —when I was slammed with a string of ads that made me feel like I was back in America. The ads were in practically shouted Hebrew, but I could discern the same two English words in each: Black Friday. (You have to say it with a Hebrew accent though, kind of like Blek Fchidey.) Clothing, electronics, home decor—all the ads were pushing Black Friday sales. Nor did the Black Friday assault stop with my television. Suddenly every cellphone text message (and I get a lot of them because I have loyalty cards at literally every store in one of the Kfar Saba malls where I do most of my shopping) is from a chain store reminding me that its Black Friday sales HAVE ALREADY STARTED! I won’t lie; I have taken advantage of these sales. In fact I visited my favorite mall today and there were Black Friday sales signs in front of every store. This isn’t the first year that I have noticed Black Friday sales in Israel. It is just that this year it became…commonplace. How did this most American of traditions—the door-busting Christmas season sales that come the day after Thanksgiving—make it to Israel? Blame the internet. Israelis order a ton of merchandise online, and every website they visit is touting Black Friday and Cyber Monday sales. If it’s good enough for Americans, it’s good enough for Israelis, right? While Israelis have come to expect these November sales, which this year come conveniently less than two weeks before Hanukkah, I don’t think most of them know why there is a Black Friday or that it is the kickoff of the Christmas shopping season. And why should they? As a nation we don’t celebrate Christmas even though it is the land where the story takes place. But everyone loves a sale. As for Thanksgiving, when we made aliyah from the States more than 18 years ago, my husband and I decided to keep the Thanksgiving tradition alive. The holiday was particularly meaningful to his immigrant grandfather, who escaped from Europe right before the Holocaust, and my immigrant father, a Holocaust survivor. The first time I tried to buy a whole turkey for our Thanksgiving dinner, butchers in three communities looked at me like I was crazy. “Al lo dvar kazeh po!” (there is no such thing here), one said, and suggested I take home a nice turkey breast. “Whatever do you want that for?”another asked. As for cranberry sauce, fuhgedaboutit. In later years, stores in Anglo neighborhoods in cities such as Jerusalem and Raanana began stocking cranberry sauce. And this year my local supermarket also started selling it, likely in deference to a new cadre of young immigrants from the United States who have moved to our community in recent years and, apparently, are continuing to observe Thanksgiving. When I went to order a whole turkey from the local butcher, the woman at the counter told me I was the third order that morning! The term Black Friday became widely recognized in the 1980s. According to several sources it was dubbed “black” (as in negative, as in “black eye” and “black sheep”) by police in Philadelphia to describe the crowds and traffic on the day after Thanksgiving and the day before the Army-Navy football game. In an effort to make the term more cheery, retailers took on the explanation that success on the day makes the difference between finishing in the red, or operating at a loss, to being in the black, or operating at a profit. Do Israelis know this? I have no idea. But every time I hear or see a Black Friday ad, I feel like maybe too much of America has crept into our society. We already have pre-Rosh Hashanah and pre-Passover sales, since they have also become gift-giving occasions. But Black Friday? It’s just not Israel. All I know is that I can’t wait for Friday and the end of the bombardment of advertisements. Besides, the End of Season sales will already be starting soon. (JTA)—If you read the Harry Potter series in Hebrew you may have noticed a curious Jewish fact: Though Sirius Black isn’t Jewish, the character sings a Hanukkah song in one scene. In an interview with Entertainment Weekly, Hebrew translator Gili Bar Hillel reveals some behindthe-scenes tidbits about her Harry Potter translation process. In the original English version, Black parodies a Christmas song, God Rest Ye, Merry Gentleman, but Bar Hillel felt that wouldn’t resonate with Israeli readers. Instead, she referenced a well-known Hanukkah song, Mi Yimallel (Gvurot Yisrael) so that Jewish readers would be able to relate. The phrase is “a portmanteau of ‘hagig’—a fleeting idea—and ‘gigit’—a washtub,” Bar Hillel says. It doesn’t seem like author J.K. Rowling would mind the liberties Bar Hillel took. The British author has recently become a vocal critic of anti-Semitism, using Twitter to call out people peddling anti-Jewish arguments. Her latest book even includes a villain whose obsessive hatred of Zionism turns into anti-Semitism. JERUSALEM (JTA)—Israel Post and the U.S. Postal Service have issued a joint stamp for Hanukkah. The stamp art features a Hanukkah menorah created using the technique of papercutting, a Jewish folk art, by artist Tamar Fishman. Behind the menorah is a shape that resembles an ancient oil jug representing the miracle of the oil that burned in the candelabra in the Holy Temple in Jerusalem after its sacking and recapture for the eight days necessary to resupply. Additional design elements include dreidels and a pomegranate plant with fruit and flowers. The stamp is being issued in the United States as a Forever stamp, which will always be equal in value to the current first-class mail one-ounce price. It will sell in Israel for 8.30 shekels, the cost of a regular first-class stamp. The first joint U.S.-Israel Hanukkah postal stamp was issued in 1996. SECAUCUS, N.J. (JTA)—Once a year, this swampy neighbor of New York City turns into kosher food heaven. Jews from across the country gather at the Meadowlands Exposition Center for the world’s largest kosher food trade show, Kosherfest. There’s plenty of nosherai, Yiddish, and kippahs to go around at an event where attendees skew Orthodox and male. Some 300 exhibitors showed their products Nov. 13–Nov. 14 to an audience of approximately 5,000 food industry professionals, vendors, and journalists. One of the more unusual products at the 2018 Kosherfest is just for Hanukkah. Klein’s Ice Cream gives sufganiyot a run for their money with a cake with slices that look like Hanukkah menorahs. The pareve (non-dairy) and vegan dessert is made of cherry and passion fruit-mango sorbet and is topped with chocolate icing. The health-conscious can delight—or at least take solace—in the fact that the cake, which comes pre-sliced, is made with real fruit. (Another version has slices that look like candle flames.) The menorah cake is only sold around Hanukkah, but those looking for a cold treat can buy other varieties of Klein’s Ice Cream year round. A 12-slice log costs about $30 and is available in kosher supermarkets. “If you buy it for your kids, your kids will love you,” says Victor Klein, manager of Klein’s Ice Cream. AMSTERDAM (JTA)—Nothing about the appearance of object MB02280 at this city’s Jewish Historical Museum suggests it is the capital’s priciest Hanukkah menorah, worth more than the average local price of a duplex home. Shaped like the body of a violin, it is only 16 inches tall. Its base cradles eight detachable oil cups intended to function as candles on Hanukkah, when Jews light candles to commemorate a 167 BCE revolt against the Greeks. They are set against the menorah’s smooth, reflective surface, whose edges boast elaborate rococo reliefs. But for all its charms, the Nieuwenhuys menorah—its creator was the non-Jewish silversmith Harmanus Nieuwenhuys—doesn’t stand out from the other menorahs on display next to it at the museum. Far from the oldest one there, the menorah certainly doesn’t look like it’s worth its estimated price of $450,000. The Nieuwenhuys menorah can hide in plain sight because its worth owes “more to its story than to its physical characteristics,” says Irene Faber, the museum’s collections curator. Made in 1751 for an unidentified Jewish patron, the Nieuwenhuys menorah’s story encapsulates the checkered history of Dutch Jewry. And it is tied to the country’s royal family, as well as a Jewish war hero who gave his life for his country and his name to one of its most cherished tourist attractions. The price tag of the Nieuwenhuys menorah, which does not have an official name, is roughly known because a very similar menorah made by the same silversmith fetched an unprecedented $441,000 at a 2016 auction. A collector who remained anonymous clinched it at the end of an unexpected bidding war that made international news. It was initially expected to fetch no more than $15,000. Another reason for the more vigorous bidding: The menorah came from the collection of the Maduros, a well-known Portuguese Jewish family that produced one of Holland’s most celebrated war heroes. The Nazis murdered George Maduro at the Dachau concentration camp after they caught him smuggling downed British pilots back home. In 1952, his parents built in his memory one of Holland’s must-see tourist attractions: the Madurodam, a miniature city. “I imagine the connection to the Maduro family drove up the price,” says Nathan Bouscher, the director of the Corinphila Auctions house south of Amsterdam, which has handled items connected with famous Dutch Jews. “We don’t know who commissioned the work, but from the reputation of the artist and the amount of labor it took, it was probably a wealthy Jewish family, perhaps of Sephardic descent,” Faber says. The monogram was one of several techniques that Nieuwenhuys and other Christian silversmiths in the Netherlands had developed for their rich Jewish clients. Before the 19th century, no Jews were allowed to smith silver in the Netherlands because they were excluded from the Dutch silversmiths guilds, which were abolished in the 1800s. “This exclusion was beneficial [to the guild] because it kept out competition, but it meant that Christian smiths needed to become experts at making Jewish religious artifacts like this menorah,” Faber says. Works like the menorah on display at the museum illustrate how some Jewish customers clearly were art lovers with sophisticated tastes. Whereas the Maduro menorah was symmetrical with Baroque highlights, the Nieuwenhuys is asymmetrical with rococo characteristics that were “pretty avant-garde for its time,” Faber says. The smooth surfaces are “another bold choice, showing finesse,” she adds. Whoever owned the menorah no longer possessed it by 1907, when Queen Wilhelmina bought it for an unknown price at an auction to give it as a gift to her mother, Princess Emma. This purchase may appear inconsequential to a contemporary observer, but its significance becomes evident when examined against the backdrop of institutionalized anti-Semitism among other European royal houses and governments. But in the Netherlands, where thousands of Jews found haven after fleeing the Spanish and Portuguese Inquisition of the 16th century, royals not only refrained from such statements but were genuinely “interested in other faiths, including the Jewish one,” Faber says. Except, that is, during the years 1940-45, when Queen Wilhelmina and the Royal House fled to the United Kingdom. Wilhelmina mentioned the suffering of her Jewish subjects only three times in her radio speeches to the Dutch people during five years of exile. But this was gradually healed in the postwar years. The fact that King Willem-Alexander, Wilhelmina’s great-grandson, in 2012 gave the Nieuwenhuys menorah on an open-ended loan to the Jewish museum on its 90th anniversary “symbolizes the healing of the rupture,” Faber says.